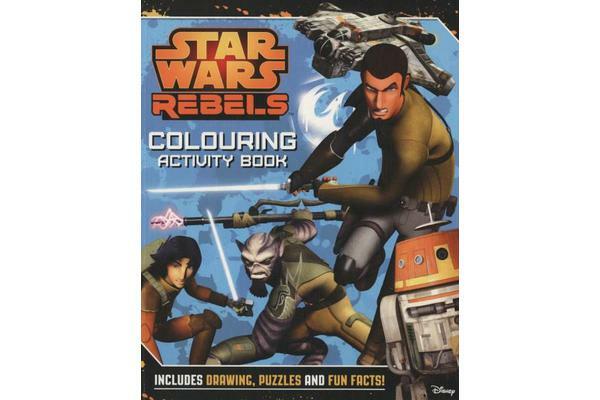 Fans of the Star Wars Rebels TV series will love this fantastic colouring book. Join Kanan, Ezra, Hera, Zeb, Sabine and Chopper for hours of creative fun. Includes pages to doodle your own starship, create your own rebel profile, and design your own droid. Plus there are puzzles, quizzes and posters of your favourite characters. Based on the award-winning animated television series that features the voices of Freddie Prinze JR, Sarah Michelle Geller, Jason Isaacs and James Earl Jones as Darth Vader, the Star Wars Rebels Colouring Book will delight young rebels aged six and upwards. Do you own the complete Star Wars Rebels Activity range? Rebels Rule Activity Book; Star Wars Rebels 3D Activity Book; Star Wars Rebels How to Draw Activity Book; Star Wars Rebels Transfer Book; and, Star Wars Rebels Story and Activity Book.